Specialized intervention centers for children and adults with Autistic Spectrum Disorders (TSA) will operate in the Republic of Moldova. In this respect, the Ministry of Health, Labor and Social Protection has drafted a Draft which provides for the Framework Regulation for their organization and functioning, which is currently in the process of approval and is to be approved by the Government. 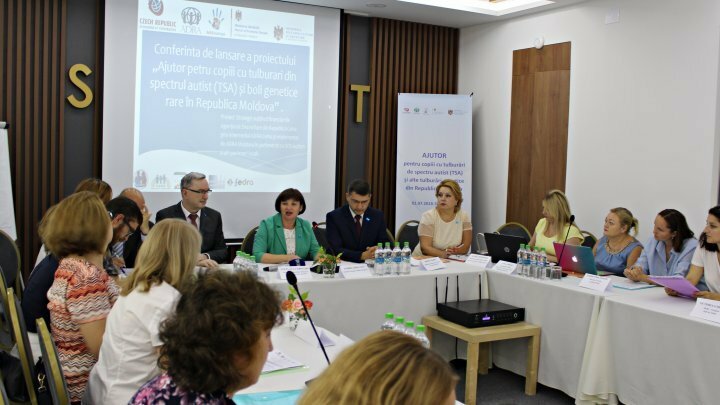 The announcement was made by Svetlana Cebotari, the Minister of Health, Labor and Social Protection at the launching of the project "Help for Children with Autistic Spectrum Disorders and Other Genetic Disorders in the Republic of Moldova, 2018-2021", implemented by A.O. "ADRA Moldova" and "A.O. SOS Autism ", with the financial support of the Czech Government. "Now, there is no state institution specialized in providing medical-social services for people with TSA, thus limiting the access to medical-psycho-social rehabilitation services. Within these centers, special support will be provided to children and young adults in maximizing their potential for physical, cognitive, socio-emotional, communicative, adaptive capacity, mental health services, logopedic correction, kinetotherapy, services psycho-pedagogical, psychological. We also welcome the involvement of development partners and, with the launch of the project, will contribute to the development and provision of services for people with autistic spectrum disorders, "said Svetlana Cebotari. His Excellency, Ambassador of the Czech Republic to our country, Zdeněk Krejčí said that through the Czech Development Agency they launched the project to improve health care, educational and professional care for people with autism. Thus, during the three years, at least 365 professionals (130 psychiatrists, 150 family doctors, 30 neurologists, 50 pediatricians, 5 geneticists) in the diagnosis of autism have to be trained in the medical, educational and professional field in the health services for autism. Likewise, 250 psycho-pedagogical professionals, psychologists, professionals in autism and genetic disorders will be trained. Also, public institutions will be supported to develop educational, professional and medical services for children with autism and genetic disorders. We mention that in the Republic of Moldova in the year 2017 there were officially registered about 346 children with autism. In the world, about one child out of 68 is born with autism, and 13% annually is the rate of increase in the number of children with autism. Autistic Spectrum Disorders (autism) is a group of deep child psychological development disorders characterized by a severe qualitative deterioration in mutual social interaction, communication and behavior.